"After 9 months, the U.K. has delivered" - the sarcastic Tweet by Donald Tusk, the President of the European Council, came on 29th of March, right after British Prime Minister Theresa May invoked the EU's Article 50 exit clause. I like the attitude. Nothing works better than humour for ending the long period of global panic caused by the shock the successful Brexit referendum has caused. Nine months have passed, and while the emotions are still running high, we are yet to see what the UK's leaving the EU is going to look like. Theresa May and her government have formally started negotiations to leave the EU. Now, they have two years to negotiate the terms of the unprecedented exit. Until it happens, we will know little about the real impact of Brexit. For many years, London has arguably been the capital of the European startup scene. I even claimed it had a strong case for being the best startup ecosystem in the world. Moreover, London officially aspired to be the world's fintech capital and was closely competing for the title with New York City. This ambition was officially expressed by prominent conservative party politicians not long before the infamous Brexit referendum. Many predicted London's fall after the referendum last summer. Representatives of the tech ecosystems in Berlin, Amsterdam, Stockholm and Dublin have been celebrating, and actively inviting companies, capital, and talent to move there. In some cases, the exodus has already begun. The London's image of a growing, culturally open, multinational business hub has suffered a major blow during and after the Brexit campaign. The uncertainty and rising xenophobia have convinced some entrepreneurs, engineers, and data scientists to move abroad. This Gizmodo post shows some of their stories. 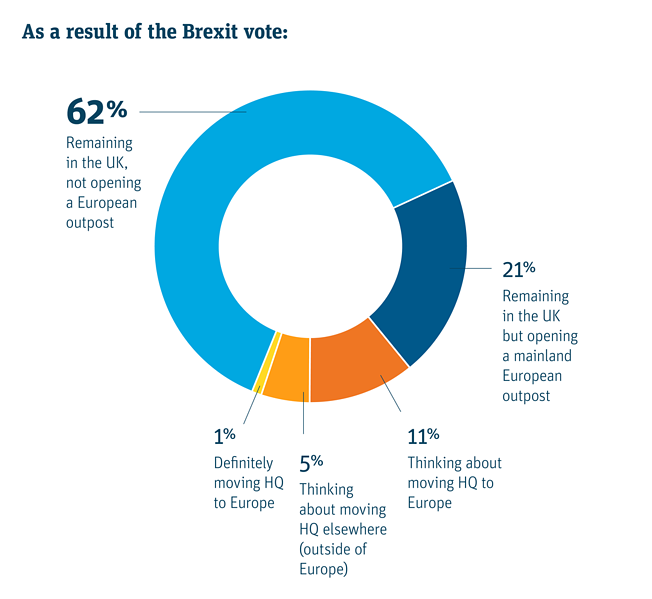 One in five UK startups plans to open an office in an EU country as a result of Brexit, and one in ten considers moving its HQ, says a survey by Silicon Valley Bank published in the newest "2017 Startup Outlook UK Report". 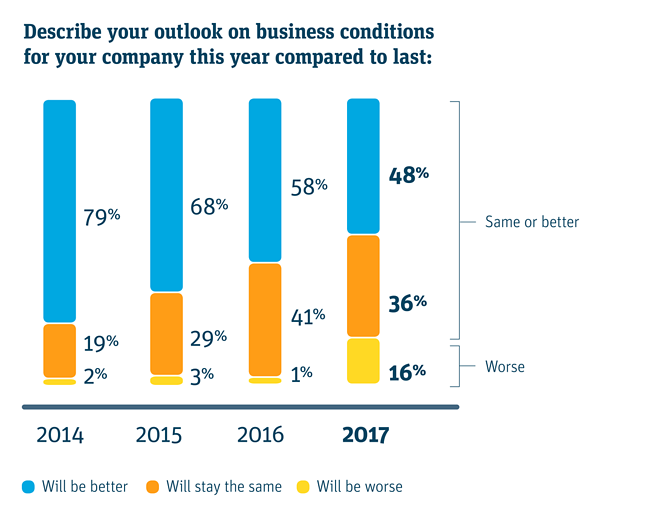 Startup executives’ outlook on business conditions has also deteriorated strongly. While these are real issues the executives are facing, not all of them are confirmed by data. "Brexit Hasn't Hit Venture Capitalists' Love for Britain", states a recent Bloomberg analysis, based on Tech City UK data. The UK attracted 6.8 billion pounds in VC investment last year, almost 2.5 more than France and 5 times more than Germany. 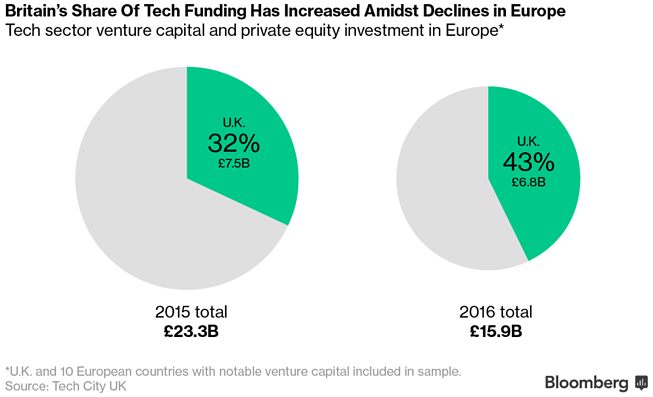 The UK increased its share of total European venture investment from 32 percent in 2015 to 43 percent in 2016. While London received 2.2 billion pounds (almost twice as much as the second best Amsterdam), the capital received less venture capital investment than the rest of the country for the first time since 2012. Cities like Edinburgh, Cambridge, Bristol, Bath, Oxford, Manchester and Sheffield benefited the most, as the capital seemed to escape from London's "brain drain trap". 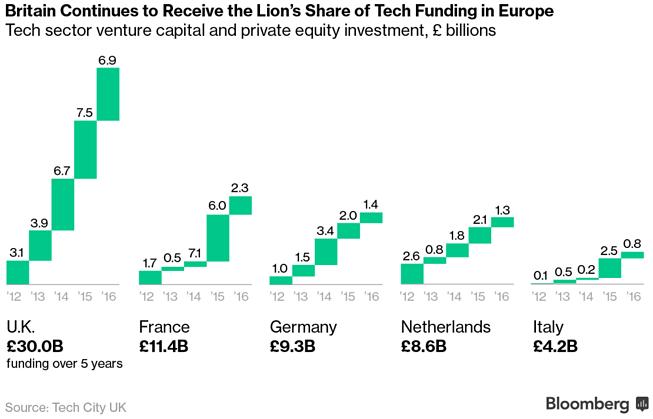 What makes it even more optimistic for Britain, is that all the VC increase happened in the year when funding in Europe fell by as much as 32 percent! The same happened with the private equity market as a whole. According to Pitchbook, deals in Britain represented 49% of all European PE activity in 2016, and the share has grown to 52% so far during 2017. There are still some massive issues that may threaten London's position as the regional tech leader. The most important of these issues is related to the fintech market. Will the UK lose financial services "passporting"? How will it influence the local fintech companies? The financial passport impacts the companies that are regulated by the UK's Financial Conduct Authority, if the want to offer their services across the European Union. This is a great advantage, since the financial services regulations differ from country to country, and meeting all these requirements would be very costly. British companies, such as Transferwise, may lose this privilege. This issue is a big threat not only to fintech but to the prosperity of the whole City of London. The City becoming threatened is actually good news for startups and scaleups, because the biggest financial corporations have dedicated lots of resources to lobbying for the right solution. As described by "The Financial Times", this may vary from Britain simply retaining the passporting by joining the European Economic Area (like Norway, Iceland or Liechtenstein), or UK-based companies being forced to open local subsidiaries in the EU. Even though the conditions may prove to be satisfactory, the City of London is expected to lose jobs. According to Morgan McKinley's survey quoted by Business Insider, "the number of new available jobs listed in the the UK's financial centre fell 17% in February year-on-year to 6,945". Such a turn of events may be beneficiary to the fintech sector, since financial sector specialists will finally become more available. We don't know what will be the UK's policy towards foreign workers. The hostility to EU migrants was the driving force of the Brexit campaign, and the Tory government needs to respond to the needs of its electorate. While in London one in three digital workers isn't a British citizen, just one in ten comes from an EU country. UK-wide, these numbers are just 13 percent and 6 percent respectively. While it is a lot, I think the common perception is that the role of EU immigrants in the tech industry is much higher. It seems that a lot of companies are outsourcing their digital jobs to EU countries by creating remote teams. They hire developers and designers, and cooperate with them directly, even though they might be scattered across the entirety of Europe. The only true limits for remote teams are: language skills, time differences, and really long distances, which require long flights to meet in person. One thing we know for sure: Brexit won't change any of these. While Brexit is a groundbreaking event in the history of Europe, geopolitics, and global economy, I think its direct impact on tech businesses is overrated. Modern agile companies have long ago surpassed the constraints of state borders and work permits. Even if the City's lobbies fail to win a favourable financial passport solution, I am convinced fintech startups will find an easy and cost-efficient way to operate on the EU market. The biggest threat of Brexit I see is the growing hostility towards foreigners. This is not only a British problem. It is happening in France, Italy, Poland, and practically in every other European country. But this is not a problem specific to the tech sector either. It's a huge challenge Europe will have to face in the coming years.